I’m sure the streets of Spain were ringing with great happiness and relief today. Noise usually associated with fiesta would have rung out throughout the country. Why? Because the Most Annoying Boy in Spain was out of the country. How do I know this? Because he was on our mini-bus. And it was a mini-bus that we spent an awful long time on today. As well as the Most Annoying Boy in Spain, we were also joined by Papa Sikh, Mama Sikh and their two boys. For quite a while we thought Papa Sikh was our guide. He kept telling us stuff from the front seat, after all. Seemingly translating instructions from the driver, he would let us know how long we were stopping, where the toilets were…that sort of thing. But no, rather than our guide he turned out to be the most entertaining person I’ve met for a long time. 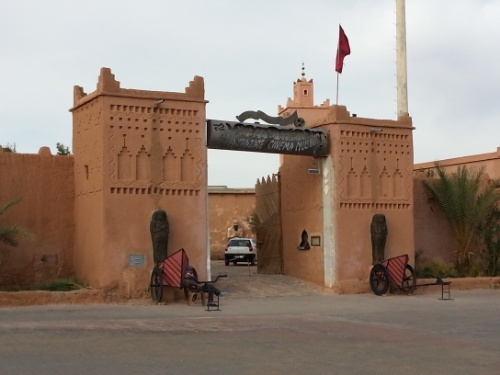 Also in our party was a couple from Melbourne (presently living in London) who had the misfortune of staying in a riad north of the tanneries. Their horror story of getting to it on their first night almost matches our fateful visit to that particular part of Marrakech. Travelling with the Most Annoying Boy in Spain were a few of his friends who, quite often, tried to out-annoy him and, though they tried, it was in vain. He really was that annoying. 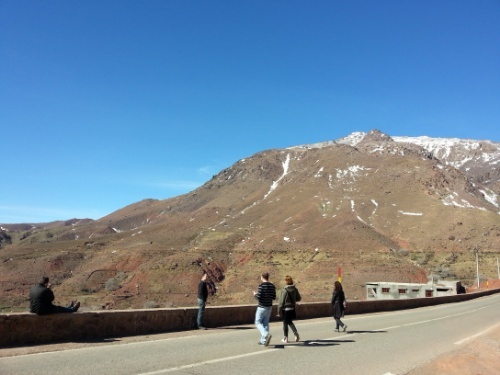 But, as I said, we spent a lot of time on the mini-bus today – about 500km worth actually – as we headed south of Marrakech and into the Atlas Mountains. And it was a long, long climb, often through long sections of Galston Gorge type twists and turns only a lot more of them with a steeper drop. Before I go much further, I need to make a couple of slight corrections to yesterday’s post. Firstly, Nicktor claims we saw five bottle shops yesterday rather than three and we didn’t go anywhere near the desert today. Our Berber guide, when asked by Papa Sikh when he’d see the desert was asked if he was going on the three day tour. Papa Sikh answered no. The Berber guide then asked if he was going on the two day tour and again Papa Sikh shook his head, saying he was only out for the day. The Berber guide replied “You’ll not be seeing the desert then.” So I guess it’s too far away. Mind you, it’s always good to leave something for next time. But I’m jumping a long way ahead of what turned out to be the best day of our trip, even with the long mini-bus ride with the Most Annoying Boy in Spain. After successfully leaving the environs of Marrakech, we headed out along the highway, the mountains rising ahead of us. We hadn’t gone far before we stopped. We’d only been driving for about ten minutes. This seemed extreme even by Marrakech standards. But no, we were merely stopping for petrol. The garage we stopped at, however, didn’t have any petrol. Fortunately we had enough to get us to the next petrol station which Papa Sikh helpfully pointed out for the driver. Don’t worry, I’m not going to go on listing all the amazing places we stopped at. I’ll just mention the fact that I have become Nicktor’s Geological Advisor (everyone should have one) and also bought myself a lovely pink geode for my office. There’s an awful lot of geodes and fossils for sale on the mountain. We were offered a very nice trilobyte which we said was way too expensive and yet, the guy wouldn’t budge from 600 dirhams. Then, as they bus was pulling away, he held up three fingers indicating he’d sell it for half. Stupid man. As if I was going to tell Papa Sikh to tell the driver to stop. I might have gone for 300 if he’d said it earlier. Maybe he’s new to the haggling game, after all we’d started at 100. 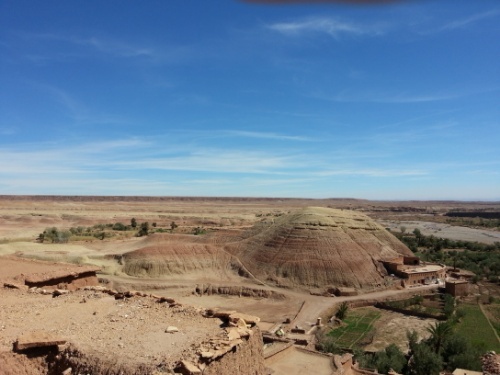 And then, after numerous stops for photos and general avoidance of the locals, we arrived at Ait-Ben-Haddou. What an extraordinary place. In fact, there are no superlatives to accurately describe it. It is, without doubt, one of the most amazing places I’ve ever visited…and one I’d never heard of. 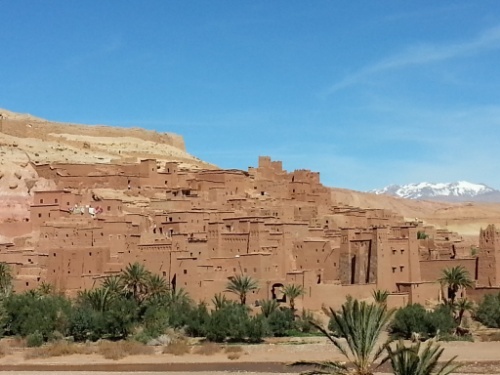 Ait-Ben-Haddou looks, for all the world, like a collecton of big wet sand castles. It was originally built in the 11th century by Berber folk and served as a trading post and stopover for the caravans that regularly passed by on their way from the Sahara to Marrakech, laiden with everything that needed trading (and which are sent in containers these days). In fact, the spot where the traders would make camp, just outside the entrance to the city was used as the arena in Gladiator. That was the view from the new Berber town which was built 45 years ago, basically, it seems so the inhabitants could have toilets. We started here with our lovely guide, Mohammed who, while living in the new town, was descended from a family who had lived in one of the mud houses. There are still five families who live in the original village and we’d like to think that it was they who sat around with things to sell. Not that we bought anything from them. Though, speaking of which, Mama Sikh was adamant they were not buying another thing, something that seemed to have missed Papa Sikh’s ears. He looked over just about everything with the air of a man about to unsnare a bargain. He stopped at every stall, much to his wife’s consternation, and kept disappearing. He really was someone who knew what he wanted, where he wanted it and how. He took little direction and just ploughed whatever furrow he felt like. As I said, earlier, we fell a little bit in love with Papa Sikh. From the new town, Mohammed led us down to the river, which we crossed via sandbags wedged into the bed. I must confess that I asked a local lad for assistance on the last one, for which I paid a few coins. I figured it was better than getting soaking wet feet for the rest of the day. Apparently, the river can get quite widespread when it feels like it and then, they would have donkeys for the tourists to ride across. Obviously it never gets very deep. Then, for reasons known only to themselves and ignoring the economic plight of the inhabitants, the government decided to build a bloody great bridge. This means that when the river is seriously flowing, tourists just walk across the easy way. Stupid government. Ait-Ben-Haddou was made a World Heritage Site because it was deemed to be of great significance and, to this end, tourists can only skirt around the edges of the actual medina, though, to be fair, this is more than enough and, after all, who wants a load of foreigners peeking in through your windows. In the time since UNESCO decided to make it protected, a lot of restoration work has been undertaken. Given that it’s made of mud and straw, this is clearly something that needs doing a lot. Interestingly, while the Berbers only build out of mud and straw, when the Jews moved in, they decided to use mud bricks to build their synagogue and it looks totally out of place among the mud huts. So, we climbed and we climbed along narrow alleys and steep stairs until we reached the top. And what a glorious view. From the new town to the Atlas Mountains in the far distance and then to further downstream. The day was so beautiful and clear that we could see for miles. This image is one of many I took but is my favourite…well, until I get home and look at my proper camera shots. Having climbed to the very top, we then climbed back down again, heading for the new town for a lovely lunch (I had chicken tagine while Nicktor opted for grilled chicken) which we enjoyed in the company of the couple from Melbourne who couldn’t wait to tell Nicktor about the Ashes series just completed in Australia. He then announced that we Aussies didn’t pronounce certain words properly. He was seriously outnumbered. He gave up. Lunch over, we headed back to the mini-bus for the short trip to the Cinema Museum of Ouarzazate. Underwhelmed is a word that sprang to Ms Melbourne’s mind and I think she’s right. Sadly, not much could compete with where we’d just been. But then, finally, it was time to make the long, long journey back to Marrakech. 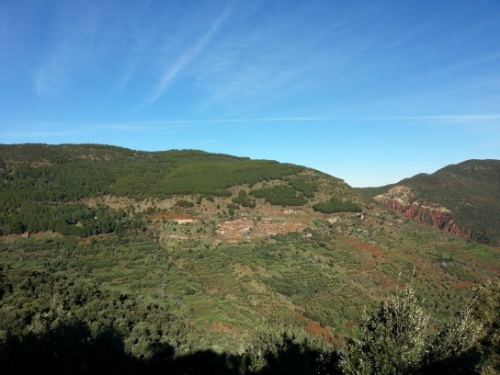 It was made even longer by the incessant noise made by the Most Annoying Boy in Spain – I’m fairly certain he classes it as communication but to my ears it was just annoying. Nicktor didn’t notice it as much as I did, seeing as he was seated in front of me and also because he was delighting in the conversation between Papa Sikh and the driver. Papa Sikh was asking about a bottle shop where he could get some whisky, brandy or vodka. The driver didn’t really understand but told him something. When Papa Sikh asked him what time it closed, the driver said 8 o’clock to which Papa Sikh replied: “In India they open at 8 o’clock!” which he thought was very funny. As we reached the outskirts of Marrakech, Papa Sikh offered the driver 50 dirhams if he’d drive them to their hotel but the driver just laughed. Apart from anything else, 50 dirhams is only £3.70 so it wasn’t much of an inducement. He never went to 100 and was, unceremoniously dropped off in the Kasbah and told to catch a taxi. Mama Sikh was lovely and popped her head into the bus to say goodbye to everyone. I’m going to miss the Sikh family. We eventually landed at the square and headed for the hotel, stopping off on the way for a burger and coffee at the lovely place a few doors down from the hotel. Quite by coincidence, they were televising the Athletico v Real Madrid game and we managed to watch a bit of the first and all of the second half before heading up to our rooms for bed. One odd spot on the day is that Nicktor has been bitten in numerous places by something (or several somethings) but hopefully it (or they) will stay in Marrakech. So, nothing to worry about, Dawn. All in all, this was our best day of the entire week (I’m assuming our planned visit to the window frame museum tomorrow will not be quite as good), made more so by the fact that we were not hassled in anyway by anyone. We felt free to enjoy the delights before us without having to wave away taxi drivers, space-cake sellers and Rolex/sunglass men every ten seconds. In fact, contrary to most of our experiences, no-one we met was out to rip us off at all today. The guide didn’t go on about a tip and the chap at the restaurant wrote off 10 dirhams of our bill just because it could be rounded down to 200 dirhams. It was a splendid day, all round. Well, apart from sharing a mini-bus with the Most Annoying Boy in Spain. This entry was posted in Gary's Posts, Marrakech 2014. Bookmark the permalink. What a great family would have made your trip more interesting.